Trying to figure out whether an annual pass makes financial sense for your Walt Disney World trip? Are there times when it’s better to buy one than individual tickets? 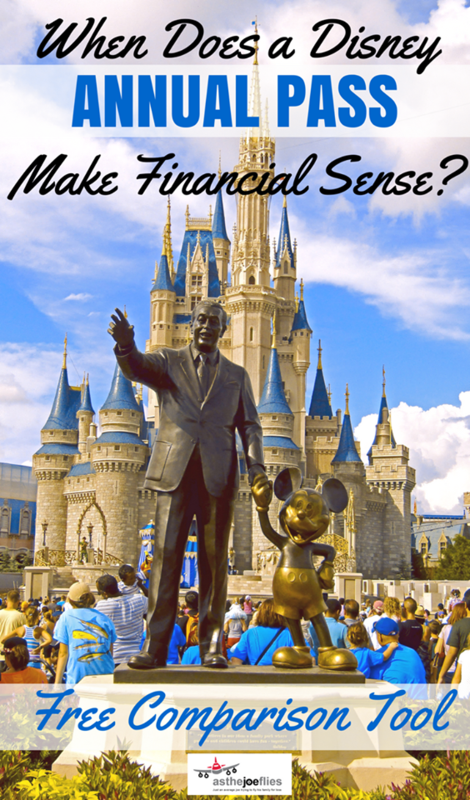 This post will explain what you need to know to make the best financial decision for your Disney World vacation. Update: With the new 2019 prices going into effect as of 3/12/19, this is an update of my article from 2016 about how an annual pass often makes financial sense. Since Disney World has gone calendar based, I can’t account for every singel ticket available. What I’ve done is used the median ticket price for calculations. I’ve updated the Annual Pass calculator with these median prices – add in your trip lengths and options to see if buying the Disney Annual Pass makes sense for you! Scroll to the bottom. @asthejoeflies 😱 yeah, ticket math often makes an AP a good call. So what ticket math would make an annual pass a good call? I think I read somewhere that if you are spending at least 12 days in the parks over a calendar year an AP is probably worth it, but to me, it’s even less than that. Towards the bottom of the post I have created a simple tool that you can use to calculate costs for your own situation if you want to skip ahead! Let’s take these one by one before we go through the ticket math, in order of importance in my mind from least to greatest. For discounts on lodging and dining, my guess is take it or leave it. There are often sales during off periods available to everyone of up to 30%, I read online AP discounts are usually up to 30% as well on hotels. My guess is during peak times you’re probably looking at paying close to the rack rate anyway, it’s just simple supply and demand. I’d love to hear people’s experiences in the comments though. Dining discounts can add up, Disney annual pass holders have had a running 10% discount for a few months. Penny pinchers bringing their own food obviously might not save as much with an annual pass. Park hopping is great, but to me it’s usually more of a luxury than anything else. If you are staying for a week, like we did, spending one day per park is definitely enough. If you’re thinking about getting an annual pass, then you definitely have the time to spread things out and visit one park per day. I’d say the only exception is dealing with the Magic Kingdom and young children: taking the ferry or monorail across the Seven Seas Lagoon adds like 15-20 minutes to your commute each way and makes going back home for a nap really annoying. The luxury of park hopping to Epcot for dinner is very tempting. But I still think it’s a luxury (more on that later). Free Disney Photopass downloads are another luxury, but you can glean a lot of value out of this benefit. Unlike Memory Maker (subject of my next post), you don’t get automatic downloads of your friends and family pictures. However, that’s pretty easy to circumvent – anyone who is linked as family and friends to your My Disney Experience account effectively receives your Photopass privileges. You can download their photos as if they are your own. If you don’t want to make people your friends and family, grab a Photopass card (say, from a character meet and greet or something). Scan the same Photopass card for whatever photos they take. Then link all those Photopasses to your account and for a little extra work you should be able to download everyone’s photos (in theory at least). If you’re saving money by staying off site, free theme park parking is huge – $25 a day adds up quickly. Doesn’t mean anything if you’re staying on site, but it adds up quickly if you’re trying to save money by staying off site. Sometimes it might make sense for at least one person in your party to grab the annual pass just for this benefit. Of course, getting admission to all four theme parks for a year is great. And that’s where the ticket math comes in. Here’s a quick tip that a lot of first time Disney goers might not know: as long as you have at least one unused day left on your ticket, you can use the value of your ticket to “upgrade” to a more expensive ticket at any time. Put a pin in that and we’ll get back to it. As you can see, with all the things I ended up tacking on to my tickets, I spent only $60 less than I would have spent if I had gotten an annual pass. That year, I visited Orlando again for FT4RL4, so bought another ticket – that cost more than $60. So you can see how ticket math can really hurt you. And even if I hadn’t visited a park, I probably would have gotten close to $60 back with the dining and merchandise discounts. I would have spent less money if I had bought an annual pass in 2016. Is an annual pass the right decision for you? Should you get an annual pass? In my case, I think we should have bought at least one annual pass. There are also some pretty easy rules of thumb. However, if you want to mess around with some calculations yourself, here’s a simple tool I made. You can input trips you plan to take and ticket types you plan to buy, along with Memory Maker and parking. At the bottom of the table, you’ll see how much you will save with an annual pass or how much more you’ll spend. The tool is in beta so please let me know if you see any errors! You can either click the link below or I’ve embedded the tool at the bottom of the post. Update 10/16/2018: Since I obviously can’t account for all of Disney’s variable pricing, I’ve done my best to take the AVERAGE ticket prices for the year. So this Annual Pass calculator tool should be in the ballpark, but if your number is close, you might want to throw your actual dates into Disney World’s website. Disney Annual Pass Calculator Tool! If you want to go deep down the rabbit hole, check out this very amazing and very in depth spreadsheet made by Touring Plans forum user JJT. It includes a bunch more options plus info on ticket discounters. Note: Only use the tool if you’re not a Florida resident, since Florida residents get discounted rates on everything. As I mentioned above, as long as you have one unused day on your ticket, you can upgrade it to a more expensive ticket. This includes adding park hopper options, water park options, or even upgrading to an annual pass. If I had figured all this out about the annual pass before I had gotten to the parks I probably would have upgraded to an annual pass on the first day. Unfortunately, I didn’t realize this until day six, meaning I had already paid $120 for parking. But if you have a trip planned and you’ve already bought tickets but want to upgrade them, you can totally do it before you pay for all the parking and make it worth it. You can upgrade at the ticket booths at the park, but that of course would require you to pay for one day of parking. You can also do it at any Disney hotel or at guest relations at Disney Springs. I think if you bring your parking receipts they can be applied to the cost of the pass as well. If you’re going to Disney World for close to a week, you should definitely think about upgrading to or buying an annual pass, especially if you are going to have to pay for theme park parking. The math often makes it worth it – feel free to use my table if you’re too lazy to do the math yourself! Can’t get enough Disney? Check out our Disney planning podcast, Disney Deciphered (latest episode embedded below)! We’ve had APs for several years. The price really jumped this year and I’m not sure if we’ll continue to get them. A couple of thoughts…don’t buy an AP for the room discount. Years ago, the AP room discounts were definitely a perk, but they have really closed the gap between AP room discounts and general public offers. If anything, it seems like you may save an additional 5% off the room. Sometimes the general public offers are better than the AP discount. Park hopping might be a luxury, but it is really nice to be able to split your day up between two parks. I really can’t visit WDW without park hopping. I love MK first thing in the morning, but I have to force myself to stick around for the evening entertainment because it just gets so congested. My ideal days at WDW usually involve starting at MK and park hopping to Epcot or Animal Kingdom (which is an underrated afternoon park). Also, DHS is going to be a mess for the next year or two. It probably isn’t worth the money to go to that park for a day, but if you can park hop it is still worth it. If you go to WDW a lot, the Memory Maker is nice, but you can only have so many pictures in front of the castle. I would gladly give that perk up to bring the cost of the AP down. Perhaps one of the best perks of getting an AP is the ability to get the Tables in Wonderland card. It’s a dining discount card that gets you 20% food and drinks (alcohol included) at most table service restaurants and some counter service. It cost $150 (it also had a huge price increase this year…used to be $100), but if you are a family going on a couple of trips to WDW a year, it quickly starts saving you significant money off dining. It’s a much better value than the dining plans. You forgot merchandise (10% off Disney owned plus a handful of others) and food discounts 10-20% off depending on the location (excludes quick service). These two can add up to $50-$100 pretty easily over a week. Activities like Splitsville (20% discount), Water Parks ($4 off adult/$3 off child), and 15% off Amphicar Tours. 10% off boating and water sports. Occasional offers for Pirates League or Bibbidi Bobbidi Boutique. The Resort discounts will sometimes be about 5% higher than the public offers but the real perk is that you get a chance to book the offers before everyone else. For specific room types (Garden View at Contemporary for example) this is a pretty big advantage. I didn’t see anything about the food discount online – tables in wonderland costs $150 right? Oddly the perks you get with an AP are hard to find until you buy one and get the insert that lists them, in teeny tiny print. Tables in Wonderland gives you 20% off at sit downs and is a fantastic deal if you have a large group that drinks, since alcohol is included. As far as I know it is the only way to get discounts on adult beverages. It was a much better deal at $100 🙁 I do not have one as I tend to travel with DVC owners who can buy one at a better discount (or they could last year, it is getting hard to keep track as Disney is changing things up so often of late). The AP discount for dining is somewhat random, mostly 10% and some places only good for lunch seatings. If I am not with someone that has Tables in Wonderland I always ask. Same for the merchandise discounts, I always ask. I’m pretty sure that the Tables in Wonderland price has always been the same for AP holders and DVC members. It is Florida residents without AP’s that have always had to pay more ($25 more). For an AP/DVC, the break even point is $750. If you have an AP, TiW is generally a good investment, but of course, that depends on your dining habits. AP/DVC also can get 10% (a few places 20%) at selected restaurants. There is a list of AP benefits that is kept current on the grandmother of all Disney sites: allears dot net. Having a Chase Disney Visa can also get you a random 10% off at shopping, restaurants, etc. We’ve had the fee free one for 10+ years that we break out for discount and other minor perks when we travel to WDW or DL. This may be a bit misleading. Disney transportation is included with your stay at Swan and Dolphin, therefore no need to pay for parking at the Parks. However, Swan and Dolphin do charge a parking fee – count on $20 plus tax if you have a car. Oh I didn’t know they charged for parking! Good tip! Great article. My wife is a Disney fanatic (okay, I’m guilty of it, too), but there is another secret that will save you a couple bucks when you first buy an AP. It’s called ticket bridging. Essentially, you buy the most highly discounted ticket you can find online (from Parksavers, Undercover Tourist, etc.). So, say you buy a 7-day ticket on Undercover Tourist for $400 when Disney.com is charging $450. Next, you take your ticket to the gate upgrade to an AP. They only make you pay the difference from their retail ($450) price of the ticket and the cost of the AP. So, you’re shedding $50 off the cost of your AP. If you decide to stay on WDW property, you can avoid that ferry/monorail delay getting to Magic Kingdom, as the transportation system bus takes you much closer to the entrance. That’s one of the many reasons (including the magical Magical Express to and from MCO) that we now always stay on-property. Yeah great point. I frankly want to avoid the ttc at all costs! Any information on the price for Military (active & ID holders?) I understand there are perks for service appreciation. Any information is appreciated. Hey Lisa – I poked around and found this. 5 days for $246 or 4 days for $226. It says limited time but my guess is they extend it. Looks like a pretty great price, thank you and/or your family for your service. We’re Disneyland people who take an occasional trip to Disney World (once every 3 years). Our next trip is slated for 2019. We just came off a year of APs at DL and LOVED it, but are ready to go back to our once per year trip. I calculated our savings over the year for parking, merchandise, and dining discounts, and it came out to be $735. Our per person per day park tickets were $15 over 37 days, as opposed to the $85 per day my husband paid for his 3 days with us. With Galaxy’s Edge opening in 2019, I’m determined to get the Premier pass (only for myself) for our one trip to WDW, then starting the clock on APs for the kids at DL later that year. However, the AP discounts at WDW don’t seem as lucrative. MM will be a savings, but we won’t need parking with staying on site. At DL, we enjoyed 15% off all quick serve and table dining, and a whopping 20% off merchandise! I am definitely second-guessing my ticket math if the Premier will even be worth it on the WDW side. At this point, I could include the $75 I’ll be saving for not having to add on MaxPass at DL, but who knows what that will look like in 2 years! I should add that we won’t have a car at DW, so that takes parking out of the equation. I would like a peek at the list Haley alluded to so I can see if the dining discounts might make a difference. I’m also curious if there’s a difference buying the pass in CA over FL due to taxes ($102 in savings). If I’ve saved up enough discounted Disney gift cards by September, I may test it by buying the pass a year ahead at DL, waiting to activate it in 2019 at DW. Was searching The Google and saw you linked to my Worth It to Upgrade to AP? spreadsheet – thanks for the kind words! That thing is amazing, you deserve all the credit! When it comes to getting photos when having an annual pass, you don’t need to scan your band for someone else’s photos- just link up with them in your Disney App. You’ll be able to see all of your friends and families photos every time they go to the park (without you). The locals know the thing or two..